My ZonePerfect Challenge Revisited And Prize Pack Giveaway! 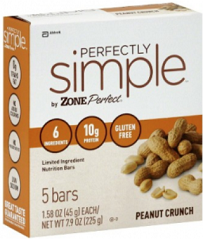 Fine Print: I was given a prize pack and ZonePerfect is giving another to a reader. All opinions and statements below are my own. Learn to meditate – Okay, so this hasn’t happened, but I have kind of reframed it. Both my son and I have a tendency to experience anxiety and let it get ahead of us. We were both going to try to meditate, which we did, but it hasn’t felt like the correct route for either of us (at this point). Instead, we have started reading a book together at bedtime. To be clear, this isn’t a bedtime story, which I read to him for years, but a book that neither of us has read and can experience together. At the moment, we’re reading the second book in the Wizard Of Oz series (which you can get for free here). We discuss it with each other, take turns reading and just enjoy each other’s company while shutting out the rest of the world. It’s a 15 minute bubble, but I’ll take it! Spend more time with my family as a family – Here I feel like I’m succeeding. Both my husband and I are trying very hard to prioritize our family over everything else. We both have jobs, there is school, there is life and there is crazy, but in those moments where we can have a family game night, we do. I will schedule them if I have to and sometimes we play during dinner on a weeknight, but it’s a huge priority for us. Even better, I feel like my children feel a difference and their happiness is my happiness. It has not always been easy to keep these promises to myself, but I really am trying! We all need ways to recharge and refresh and get back into the game. I hope that whatever promises you’ve hoped to carry out for yourself this year have been fruitful! To get everyone back in the game and recharged for the rest of the year, I am giving one lucky winner a ZonePerfect Well Being Essentials Kit consisting of a Tumbler, Pedometer, Lip Balm, Hair Ties, Hand Sanitizer, a box of ZonePerfect Bars and coupons! To enter this giveaway, complete any or all of the options listed below. Giveaway ends 9/17. Good luck! I try to sleep in as much as possible. I like my showers. I use a different bath gel and lotion a lot. I walk and meditate to relax and recharge. I dusted off the small hand weights to use daily. Also walking more. I do cross-stitch. It relaxes me. When I am feeling stressed during the day I pray and try to stop what I am doing and take some deep breaths from the diaphragm. A cup of coffee and a few minutes reading by myself do wonders for me. Go for a relaxing walk. I like to do yard work and my garden. They energize me! Coffee and tea. I usually sit down and take a break from what I am doing. I try to take power naps on the weekends to make up for all the lost sleep during the week. Take some quiet time to myself! I always have a book on hand. I go for a walk to recharge myself during the day. I relax and watch my favorite shows. I go to aerobics classes to re-energize! I take a short walk. The fresh air give me a little recharge. I like to walk, read and write to relax during the week. Good sleep, reading, and listening to jazz or other instrumental music help me to relax.